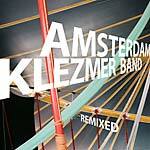 This is the ninth album by Amsterdam Klezmer Band. The story started in 1996. A few boys from Amsterdam with a Jewish background got inspired by the catchy sounds of klezmer and Balkan music and started busking. Since that time, the band has evolved into a seven-strong line-up, representing one of the finest among the klezmer and Balkan music scene in Europe. The Amsterdam Klezmer Band is blessed with an enthusiastic following in the Netherlands, the whole of Europe and even in Brazil. Their refreshing approach to klezmer and Balkan music transcends the traditional aspects of this music and results in a very lively mix of Eastern-European sound. Their strength lies in their ability to appeal to a remarkably broad audience across all age groups; they play clubs or theaters, festivals, parties, weddings or formal functions and can both fire up a crowd and create pure listening pleasure with the vibrancy of their playing. Popular Amsterdam Klezmer Band tunes are being covered and Amsterdam Klezmer Band remixes are found in many clubs from Berlin to Sydney. Now, the unmistakable Amsterdam Klezmer Band sound is optimally encapsulated once again in 14 brand-new tracks which are all original compositions written by the band members themselves. 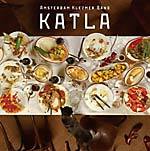 Sirba, turbo-polka and booty-shaking cocek, oompah and motley rhythms, all with the characteristic and inimitable Amsterdam Klezmer Band virtuosity, are to be found on this album. Also, of course, no Amsterdam Klezmer Band album is complete without front men Alec Kopyt (a cult singer from Odessa, who's a renowned specialist of prison songs) and Job Chajes, singing and rapping their way through this new treasure trove of highly-infectious and original Amsterdam klezmer-style repertoire. Katla is the name of the biggest volcano in Iceland. This title possibly implies this new album's explosive, joyful character. 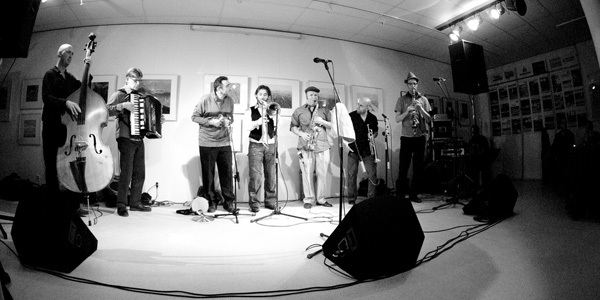 Other members include: Jasper de Beer (double bass, guitar banjo, backing vocals), Gijs Levelt (trumpet, backing vocals), Joop van der Linden (trombone, percussion), Janfie van Strien (clarinet, backing vocals), Theo van Tol (accordion, davul), Midou Akhrif (darbuka), and Bokkie Vink (cymbalon). This is the second release on Essay Recordings by the Amsterdam Klezmer Band, an energetic and poetic stage act that has charmed international audiences with their refreshing approach to klezmer and Balkan music that transcends the traditional, resulting in a very lively mix of Eastern-European sound. The Amsterdam Klezmer bug is spreading, hence the title of Amsterdam Klezmer Band's latest release Zaraza. In Slavic languages, zaraza means "infectious" or "contagious," in Polish, it is the word for "epidemic." Zaraza is indeed an infectious album from an extremely virulent and passionate band. The album contains 15 brand new tracks -- all original compositions rooted in the klezmer tradition and infused with Romanian, Turkish, Serbian, Russian and Macedonian sounds -- showcased in their purest form, with virtuoso and provocative performances by Jasper de Beer (double bass, guitar banjo, backing vocals), Job Chajes (alto saxophone, vocals), Alec Kopyt (vocals, percussion), Gijs Levelt (trumpet), Joop van der Linden (trombone, percussion), Janfie van Strien (clarinet, backing vocals), and Theo van Tol (accordion). Since its foundation in 1996, the band has evolved rapidly, becoming world-famous on countless festival tours for bringing the Amsterdam streets and pubs to the world at large. Nowadays, only part of the Amsterdam Klezmer Band repertory consists of traditionals of Balkan or klezmer origin. Most of the AKB repertory has been created by the band members themselves, who all without exception contribute musically to an ever-growing melting-pot of infectious Balkan/Gypsy/klezmer cross-over grooves. Passionate performances, spectacular live shows and a good dose of street credibility form the ingredients of their crazy cocktail. The Amsterdam Klezmer Band started as a trio that mostly played in the bars and on the streets of Amsterdam. Since forming in 1996, they have evolved into a pack of seven musicians who perform with the heritage of klezmer music, the intensity of a punk band and the inspiration of all kinds of Gypsy and Balkan dance music. Now popular guests at numerous international festivals, dance events and pop clubs, the DJs who love them finally pay them tribute with Remixed! -- thirteen original and electrifying remixed Balkan & klezmer tracks from well-known European DJs Shantel (Bucovina Club), DJ Yuri Gurzhy (Russendisko), Stefan Schmid (Zuco 103) and many more. Along with 6 remixes out of the Amsterdam Klezmer Band repertoire you will also find 7 brand new and original tracks especially recorded for this album! The idea arose after releasing nine albums to look for new ways of displaying their musical taste. After some shared club dates with DJs and creative experiments with drum computers and samplers they decided to invite some exciting DJs and producers to work on their material. The Amsterdam Klezmer Band is an energetic and poetic stage act whose refreshing approach to klezmer and Balkan music transcends the traditional aspects of this music resulting in a very lively mix of Eastern-European sound. The band endeavors to breathe new life into this traditional music with passionate performances, spectacular live shows and a good dose of street credibility. The remix artists on this album give the Amsterdam Klezmer Band a vigorous treatment that will induce frenetic, uncontrollable movement. Klez dance!